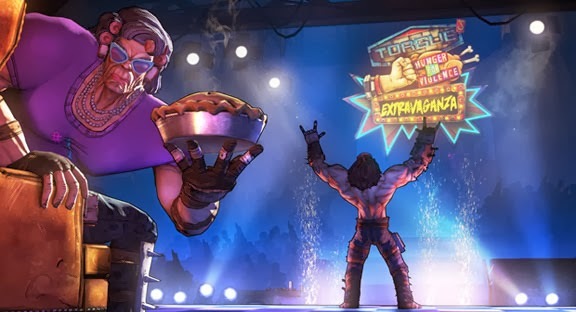 Gearbox and 2K gave us this morning a nice post about the new Borderlands 2 Headhunter pack 2: The Horrible Hunger of the Ravenous Wattle Gobbler. Seasonal festivities are one of the major inspirations behind the Headhunter series. 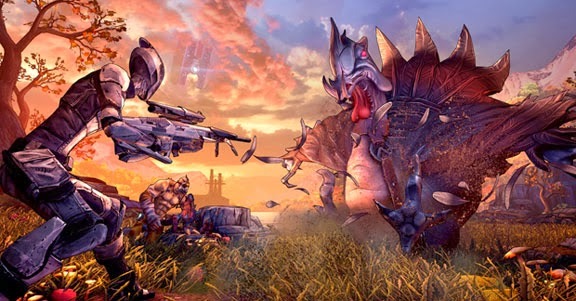 In the second Headhunter add-on, Mr. Torgue hosts a hunger-themed competition to hunt down a giant turkey, the Wattle Gobbler, and selects sacrificial recruits from all of the districts of Pandora to participate! I am super excited for this. The first pack (TK Baha's Bloody Harvest) was a bit short and a little lacking in content, but for $3, I really didn't mind. It was a few hours of extra Borderlands fun. There will of course be a dessert of heads and skins rewards, but only if we finish our main course dinner of slaying the Wattle Gobbler! We can expect the this Hunger Games-esque pack to be released on Nov. 26th for $2.99. We also will be soon finding out more about the 3rd Headhunter pack- How Marcus Saved Mercenary Day sometime in December.